Meeting companies at different stages of their lifecycle, from student entrepreneurs to start-ups and scale-ups, Mr Bradshaw was hosted by members of the SETsquared Exeter team. The SETsquared Partnership is the enterprise collaboration between the universities of Bath, Bristol, Exeter, Southampton and Surrey. They support high tech start-up companies, provide student enterprise advice and enable academics to maximise the impact of their research. 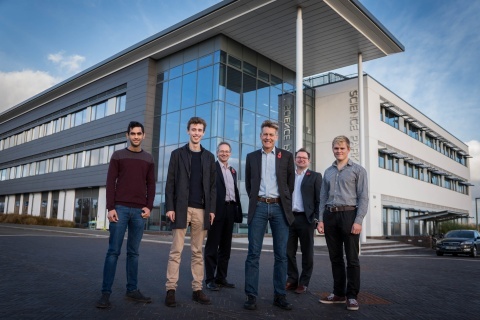 Joe Pearce, Business Support Manager of SETsquared Exeter and Exeter Science Park, said: “Exeter and the greater Exeter area have a wide range of business support networks and initiatives that can help start-ups to grow into established organisations. Student entrepreneur, Giacomo Poppi, the brains behind innovative tech company Alitica – an automated analytics system for restaurants, pubs and bars – was among those explaining his start-up to Exeter MP Mr Bradshaw, and told how he has been supported by SETsquared Exeter. In recent years, Exeter has flourished and is part of the ‘leading pack’ of cities that boast economies that have grown by at least one-fifth since 2011. The top five cities include Aldershot (32%), Oxford (25%), Cambridge (23%), Exeter (20%) and London (20%). Other businesses who have been supported by SETsquared also spoke with Mr Bradshaw, including Care Systems and Innovation (CSI), which provides custom IT solutions to meet the growing demands of the care home market; Milkalyser, which has devised technology to detect the early stages of oestrus (sexual receptivity) in dairy cows; and bespoke mobile and web software firm seeDATA. Mr Bradshaw said: “Exeter continues to outshine many other parts of the country economically – as in so many other ways. “It has been fascinating to visit the Exeter Science Park and meet many of the people behind the success stories which are helping to drive our city forward. For more information about the Exeter Science Park visit exetersciencepark.co.uk, call 01392 247047 or follow the Exeter Science Park on Twitter @ExeterSciencePk or LinkedIn.